Description of "CAMBRIDGE IGCSE O LEVEL MATHEMATICS  FULLY SOLVED PAST PAPERS - PAPER 2 [VARIANT 2]"
CAMBRIDGE IGCSE O LEVEL MATHEMATICS  FULLY SOLVED PAST PAPERS - PAPER 2 [VARIANT 2]. VERY USEFUL FOR O LEVEL STUDENTS OF ALL VARIANTS. DETAILED AND STEP BY STEP SOLUTIONS .VERY HELPFUL TOOL FOR REVISION. CONTAINS PAPERS FROM 2011 TO 2017 [INCLUDING THE LATEST PAPER NOVEMBER 2017]. TRIED TO SOLVE ALL THE QUESTIONS IN THE SPACE PROVIDED. ALSO AVAILABLE 0606 . NEED ANY OTHER VARIANT OR CODE PLEASE CONTACT nalinsaisunkara@gmail.com. Myself Sai Gopal Sunkara worked for over ten years in International Schools teaching Mathematics for CAMBRIDGE IGCSE STUDENTS. Took utmost care to make sure that the solutions are brief and explanations given where ever possible. 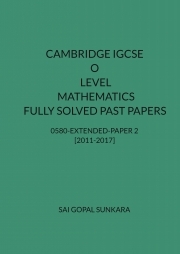 Reviews of "CAMBRIDGE IGCSE O LEVEL MATHEMATICS  FULLY SOLVED PAST PAPERS - PAPER 2 [VARIANT 2]"